Top EU officials, rather than Russia, threatened Ukraine with a coup d'état if Kiev refused to sign an association agreement in 2013, Nikolay Azarov, Ukraine’s former prime minister, said. “I’ve never heard neither Putin nor Medvedev saying that if you sign an agreement with the EU, you’ll have a different government. But I’ve heard [EU Commissioner for Enlargement and Neighborhood Policy, Stefan] Fule, repeatedly saying that if you don’t sign then the other government will sign it,” Azarov said at the presentation of his book 'Ukraine at a crossroads. Prime Minister’s notes' in Moscow. 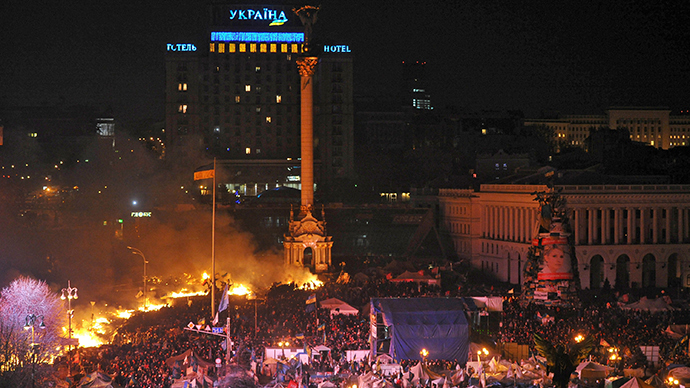 The decision to delay the signing of the association agreement by then-Ukrainian president, Viktor Yanukovich, led to Euromaidan protests in the capital, Kiev, which turned violent and resulted in a regime change in February 2014. According to Azarov, it was Washington which masterminded the plan to ouster Yanukovich and his government. Washington needed to “knock out this foundation from under Yanukovich and they achieved this aim by introducing the idea of a national unity government,” he added. Azarov quit his post as prime minister in late January 2014 amid the intensification of Euromaidan riots, stating it was in the hope that his resignation would create a chance for compromise between the government and the protesters. Meanwhile, the US, Azarov said, managed to pull Yanukovich into "useless negotiations" with the Euromaidan demonstrators, while armed men from all over Ukraine were arriving in Kiev to seize power. Over 100 were killed last February in clashes between the police and Euromaidan protesters in central Kiev, in which firearms were widely used. Following the coup, both Yanukovich and Azarov had to flee Ukraine and found refuge in Russia, saying that they feared for their lives. In mid-January, Interpol put the former president and prime minster on the international wanted list after a request from Kiev. Yanukovich and Azarov stand accused of misappropriation and embezzlement during their time in office. The new Kiev government signed the economic and political aspects of the association agreement last year, with Ukraine and the EU parliaments simultaneously ratifying them in September 2014. The ex-PM described the current events in the south-east of Ukraine where the fighting continues between rebels and Kiev troops as a “catastrophe”. With the sides being unable to reach a peaceful agreement on their own, the ex-PM urged the organization of an international conference, involving Russia, the US and Germany, to put an end to violence in Ukraine. “If the forces inside the country don’t want to stop than – as it already happened in the world’s history – the Guarantor States gather and make a decision. Trust me, Germany, the US and Russia have enough influence to stop this war, they just need to come to an agreement,” he said. The ex-PM also said that he doesn’t consider the new Ukrainian power, led by president Petro Poroshenko and prime minister Arseny Yatsenyuk, to be legitimate. “How can I consider this a legitimate authority if it came to power through an armed coup, committed monstrous crimes and now continues a fratricidal war, doing nothing to stop (the violence)?” he wondered. The Ukraine conflict began last April when Kiev sent regular forces and volunteer battalions to the southeastern Donetsk and Lugansk regions, after rebels within them refused to recognize the country’s new, coup-imposed authorities.